I am a vintage bike collector. 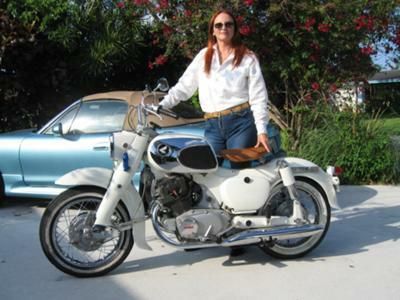 I have several (14) vintage British bikes from 1963- 1975 but by far my favorite bike is my white Honda Dream. It is the best bike FOR ME. It's a wonderful cruiser and I recovered a solo seat for it in saddle brown leater, made saddle bags and other accessories out of the same hide. We nicknamed it "Barbie" because it is such a "girls bike" and one I think Barbie would have had back in the 60's. I am looking for a Honda 305 dream in good shape. I am willing to pay for a nice bike. prefer white, but will consider any color. please, no junk. my email is cmeentp@bresnan.net. pictures would be great if you have them. I am in mt., so I am looking for something around this part of the country if possible. Back in 1965-66 a friend ask me to go with him to look at the Honda motorcycles in Dallas, Texas, he was eyeing the more sporting model but I talked him into getting the 305 Dream, he liked it but in time he turned it into a more sporting bike, painted it black, removed the fenders, made lots of changes but I still new that the orange 305 Dream was still there. The friend is gone now also the Dream but would like to find one of my own but now they are impossible to find much less buy, at 83 I'm running out of time. I just purchased a '69 Dream. Where can i shop for solo seats for this bike? I have a 62 Dream. Getting ready to restore it. All complete and excellent condition for restore. I have a 1966 Scrambler and 1967 Superhawk both 395 scrambler is Red and Black Superhawk. I love them. I have a beautiful Black 1968 Honda Dream that I want to sell. Where is the best place to advertize it. Hey we are in the same County, live in Parkland, Congrats for your white diamond!! . I have a red 305 for 20 years; love the bike's body shape, the engine noise... Every thing!! Now I am looking to get a ‘64 Suzuki t10, if you know of someone who has one please let me know. tengo conocimiento de esas maquinas como sin tacha en cuanto a su funcionamiento ,aun cuando no tengo una de esas leyendas creo que son muy buenas pues tengo un que no es honda pero si anda como ella . My buddy had a Honda Dream when we both first came back from Viet Nam in 68. Some of my best memories are from that summer. I had a white 90 Honda Iguess it was a dream rode great. Just started restoration of Honda CA77 1965. I found one in a junk yard and took it completely apart (except for the engine) for restoration. They are definitely unique with their unibody frame. Parts are hard to find so it will be years before I get it going. Now I understand why it is called a Dream. I found a new one for mine on ebay just punch in the key number on the key or the switch on ebay motors. I lost the key to my CA77 honda dream . Can I have a key made or do I have to change the entire ignition???? I just got 1968 ca77 all Red great shape one owner where can I find white wall tires? i just found one I am buying for $700.I have always wanted one. ok, I agree with you, I'm fan of Honda Dream sixties. I have a Honda C72, it came from Japan in 1961, I'm from Argentina. Need to buy my wife a dream! I have been scouring the internet for a decent Honda dream and am looking for a good running white one for my wife. Any Suggestions? Trying to find something in the northwest to avoid spending a ton on having one shipped. Oh yeah! This is a GIRLS bike alright. My dad bought me my 1966 Honda Dream 305 (white) when I was 16 (1970). I still have it and it runs like a DREAM. What a lucky girl I was when I was 16. I just bought me a 1965 Honda Dream 150 (all original, less than 2100 miles). I'm a DREAM Collector now. My car, '65 Dream, & '66 Dream all have vanity plates. If I buy more dreams, I have to come up with more vanity plate ideas. My road name is DreamLady. I love a good DREAM!!! Enjoy yours. You think its only a girls bike, well I think it's a great bike for everyone. I'm looking for a service manual for this bike or some information to answer a couple of questions. My email is fester955@yahoo.com . Please help if you can so I can get my wife on the road. I have a White dream for sale if anyone is interested it has 4516 original miles and is mostly original if anyone is interested in buying it. e-mail me at hippienamc@yahoo.com or call me at 414-331-7201 before its sold! I love the Honda dream. Hope I can find one as nice as yours. I like your Honda dream CA77. It's a handsome bike. Sherwin Williams auto paint, Diamond White. Also used on Ford trucks at one time as well. Anybody got any idea what the paint code is for a white 305 Dream? Thanks! I see that you are selling your Dream. Could you email me with some images of the bike, hard bags and original white seat, and has the seat been recovered or is it original? Also could you give the VIN and engine numbers please? I haven't been back here since I posted this! I can't believe the response! Well, I got the seat off of eBay and carefully removed the black vinyl and used it as a pattern to make the brown leather cover. My latest "favorite bike is a 1965 CB450 Black Bomber. We are now up to 21 vintages bikes since last posting and hubby says I have to "thin the herd". So this white Dream is now for sale. It runs great, needs little maintenance and is just a joy to ride. This is a 95 AMCA point bike and comes with it's original white seat. I also have some hard white saddle bags to go with it but not the hardware. You can email me at LMDutton if you are interested in owning this. Asking $3500. Bought a rough Dream with a good engine about 15+ yrs ago for about $500. Thought it was a good deal. After engine work, and replacement of cables, brakes, levers, chain, tires, speedometer, lights, re-chroming parts, rebuilt elec. starter, carb, rebuilt authentic seat, repainted authentic cream/white, tank badges, shocks.. etc. Not perfect, but turns heads when ridden. You can buy one for a lot less than I've spent. Some NOS parts are easily located, while others (horn) are hard to find. I have had a stroke so I'm selling my motorcycles. I purchased this bike about 20 years ago and it has always been garaged. It has a little over 20,000 miles on it and runs great. I have driven it very little because I bought it as an investment. It is white in color and is in excellent shape. It has a small crack on the lower part of the front fender, why I don't know. If interested send me an email to michaellspear@comcast.net. I have been trying to buy the right battery for my 68 305 dream. I'm having a very tough time, bought 2 batteries both the same battery from 2 different vendors. They were the wrong battery, it appears to be smaller than earlier battery on the 305 dreams. Please help. P.S. Bike has wrong battery in it now from old owner. Thank you, new dream owner. Love your bike, can you help a girl out and tell me what seat you bought to have recovered, where you got it the size of it etc? I'm looking for a Honda 305 scrambler 68 or 69 model. I bought my white 67 in California back in 1977 with 10,000 miles on it. It still runs great when ever I start it up. It's always kept inside and looks like almost new. Thinking about doing a powder coat on it soon. I collect old 1960's Honda's, Buy fare my 1965 Benly and my 1965 Dream are my favorites Named Ronda C.A 95 150cc, Rocken Ronnie C.A.77 1965 305cc. I also have a 1965 C.M.90cc push rod engine completely restored. Rare bike elephant gray. Will post photos soon. Beautiful Bike- have fallen in love! I am now looking to buy one of these in running condition- anyone have one for sale? Thanks Noelle email me at nfraney@reformclubinn.com Thanks! I have a complete, running 305 dream was wondering what it is worth? Very good condition. On the "Girl's Bike" issue, that is humorous. A cool bike is a cool bike. However, I can only point to a great book by Matt Stone (I think) and Chad McQueen, entitled "McQueen's Machines." Right there, on the cover, which you can view in Google Images, is the Hollywood Icon, before his Honda Dream, and a vintage racing Jag to his right. It was good enough for him...! I actually did decide to black powder coat, not only the front fender and side covers, but both sides of the crankcase, along with the carb covers I was finally lucky enough to find. All black. Kept the tank as is and got Firestone Whitewalls. Dramatic change, and works well. This white Dream we are viewing is perfect with the brown leather solo, I'm on the fence with that and black, but it sure looks right. I have one of Mike Hanlon's 1910 Model 5's, black with the brown leather saddle, and it looks right. I just had my 1967 Dream refurbished and it looks and runs great. thought of doing the solo seat but the refurbisher is a traditionalist and frowned up on it, though we may do it later. Where did you get the solo seat?? 1968 honda black in color 305 dream 264 miles never titled dad was a dealer dusty from setting but can be yours! I also collect Brit bikes, but sold many of them after a heart attack--silly me, I believed the doctors when they said I wouldn't ride again. (That was in the early 1990's...) Happily I kept a few BSA singles and a Triumph, to go with the XS650's and an R80 Beemer. Then again - maybe that's why I didn't date much in college. My most frequent mode of transportation and best friend was my white 150 'Baby Dream' Loved that bike. And yes even though it was mainly a gettin' around town bike -- I put many hundreds of highway miles on it riding it home on weekends. I sold it for $100 in 74 for traveling money to a summer job in NC. Maybe not the biggest mistake in my life. Wish I could find one for sale somewhere local. Great Bike. Had a 150 dream when I was 16. Next was a 305 Superhawk. If I knew then what I know now, the bikes would still be with me. The dream never let me down, even in snow. Did a lot of highway riding also, 45 to 60 mph speed limits. Can't wait for the run in Oct. See ya soon. Hi...On April 12th "Anonymous" stated that they had a 1968 Honda 305 Dream for sale and inquired whether anyone had interest in buying it. Well, I do, and I would be interested in chatting about it. I also have a CA77 305 Dream with only 545 miles on it. I bought it in 1983 from a collector who put no miles on it. This year however I have decided to start using it on a regular basis. It has only seen shows and parades but now it will be a regular road bike. I figured it would be a blast to use it and so far it really attracts a lot of attention. George, Bothell, Wa. I have a 68 305 dream for sale anyone interested? Post a picture of your bike by starting a new topic, you will then be able to include a picture. I want to send you a photo of my 65 Dream. Great Bike. I have an all original Black 1968 Dream with 6,200 miles. It is in Beautiful Original Condition. Beautiful bike!!!! WOW 14 of them. Nice car in the background also.